Salem took the loss as Mike Shawaryn struggled to find the strike zone. He walked four in just 2 2/3 innings while allowing three runs. Marc Brakeman was solid in relief, going 3 2/3 innings and allowing just one run with three strikeouts. Harrison Cooney tossed 2 2/3 shutout innings to finish it out. Jose Sermo had a big night by going 2 for 4 with a home run. Austin Rei added a double. Greenville walked it off in the bottom of the eighth on a Roldani Baldwin pinch-hit RBI single. Tyler Hill and Santiago Espinal each went 2 for 4 and Brett Netzer drew a pair of walks. 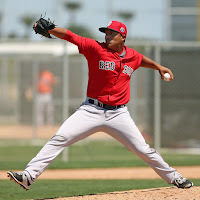 Darwinzon Hernandez dominated for the first 6 1/3, surrendering just two hits and two walks with eight strikeouts. Robby Sexton got the win in relief with three strikeouts in 1 2/3 scoreless innings. Game two between the Braves and Drive was rained out and will be made up as part of a doubleheader today. The Spinners held on after taking the lead in the bottom of the eighth on an RBI infield single by Yoan Aybar. The first four hitters in the Lowell lineup, Michael Osinski, Frankie Rios, Marino Campanos, and Juan Barriento, each collected two hits. Enmanuel De Jesus tossed five solid innings, allowing just two earned runs with one walks and seven strikeouts. Ryan Oduber and Lukas Young each threw two scoreless innings, with Oduber picking up three strikeouts. Kervin Suarez had a big day out of the leadoff spot by going 2 for 5 with three RBI. Pedro Castellanos also had two hits and Blake Swihart played first base and went 0 for 3. Rayinel Adames lasted just 1 2/3 innings and allowed three runs. Jose Gonzalez and Alejandro Rodriguez combined for six shutout innings. Isaac Pinales started and was solid, allowing two runs in five innings with four strikeouts and two walks. Geraldo Perez picked up the win in relief with two shutout frames. Reinaldo Ugueto went 3 for 4 and Keibert Petit had two hits including a double. Player of the Night: Darwinzon Hernandez had been solid all year and had allowed just two runs over his last 11 2/3 innings pitched. The lefty had a 3.89 ERA in 83 1/3 innings in 2017 with 93 strikeouts and 43 walks.